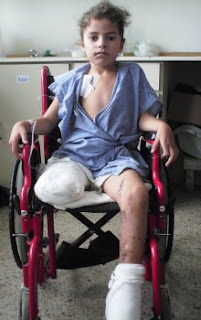 Joselyn Salguero became disabled due to a landmine. Many argue that El Salvador has come a long way towards trying to repair its disabled past by declaring itself mine-free in 1994, implementing the 2001 National Disability Rights law and ratifying the United Nations Convention on the Rights of Persons with Disabilities in 2007. The Permanent Table of the Office of the Ombudsman for Human Rights (PDDH) and disability rights civil society organizations such as the Landmine Survivors Network have led the struggle in Central America to promote the rights of people with disabilities and guarantee them “free and equal access to services” through the construction of accessible infrastructure and much-needed legislation. And yet, El Salvador has only made nominal progress in implementing disability legislation and awareness. A census tailored toward understanding disability demographics in the country, implementation of current legislation, and a greater emphasis on disability rights as human rights will help to pave the inaccessible pathway towards more inclusion for all. The upcoming 2009 elections may also have a significant impact on the provision of disability rights in El Salvador.